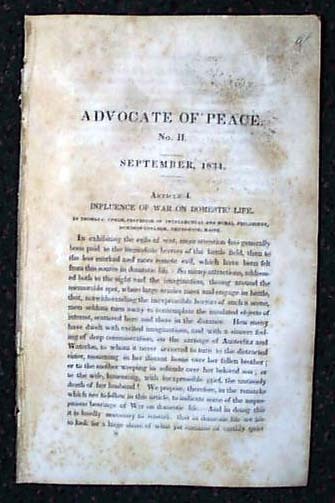 Item # 153036 ADVOCATE OF PEACE, (Hartford, Connecticut), 1834. An interesting magazine which has war as its theme, and the value of peace as opposed to war. Note that the photo is "generic" and the issue you get will not have this specific date but will have the format as shown. Forty-six pages measuring 9"x6", disbound without outer wrappers.